Serena Williams has got that pregnancy glow! 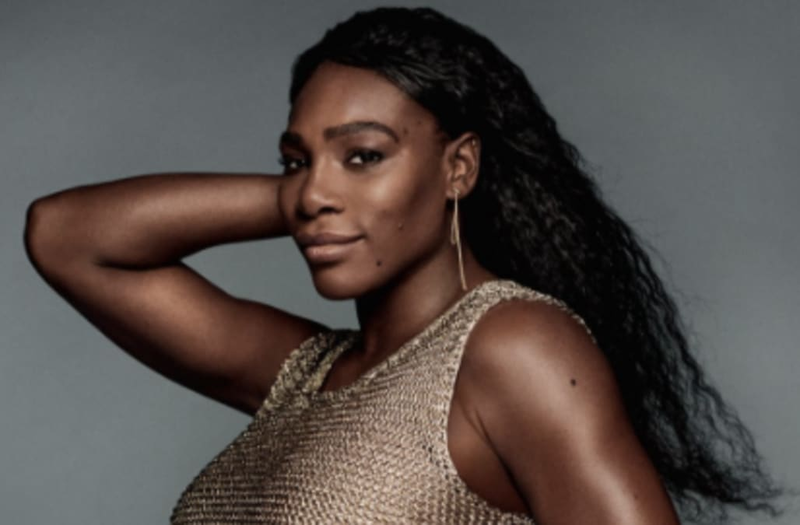 Rocking a gold Ralph Lauren dress and earrings by Zoë Chicco, the 35-year-old tennis pro stuns in Vogue's September issue, showing off her burgeoning belly. In her accompanying feature, she opens up about the surprising moment when she and fiancé Alexis Ohanian found out they were expecting, and whether or not she'll return to the court following the arrival of their first child together. As many of her fans know, Williams discovered she was pregnant while she was competing in the 2017 Australian Open. She accidentally announced the exciting news to her fans via Snapchat in April, posting a pic of herself in a bright yellow one-piece that was captioned, "20 weeks." "Once I found out [I was pregnant], something happened that surprised me," she explains. "I became really calm. I thought, 'You have to win, but you're allowed to lose, because you have something to look forward to.'" Well, she did win, defeating her sister, Venus Williams, 6-4, 6-4 in the Women's Singles Finals in January, marking her 23rd Grand Slam victory. "Alexis thinks we're having a boy, but I have a strong suspicion that it's a girl," Williams says. "Two weeks after we found out, I played the Australian Open. I told Alexis it has to be a girl because there I was playing in 100 degree weather and that baby never gave me any trouble. Ride or die. Women are tough that way." When Williams revealed she was expecting, many fans became worried that her tennis career would be over for good. But fear not -- Williams tells Vogue that she's already planning her post-baby court comeback! "It's hard to figure out what the end of your tennis career should look like," she admits. "I used to think I'd want to retire when I have kids, but no. I'm definitely coming back. Walking out there and hearing the crowd, it may seem like nothing. But there's no better feeling in the world." "Obviously, if I have a chance to go out there and catch up with Margaret Court [who has 24 major titles], I am not going to pass that up," she adds. "If anything, this pregnancy has given me a new power." New power, indeed! The outlet also talked to two of Williams' close pals, Kim Kardashian West and Meghan Markle, who had nothing but amazing things to say about the athlete. "I wish people could see her silly side," West gushes. "She is obsessed with karaoke, which personally is my biggest fear in life. I remember a dinner in San Francisco before a DNC fund-raiser. Serena sang, [Barack] Obama sang, Kanye [West] sang. It was legendary. She gives herself those moments -- it's how she recharges. Serena's the girl you can call and say anything to. She'll never judge you and she's never too busy for you. Oh, and she can keep any secret." "She will be an amazing mom," adds Markle. "The very best, because she is so attuned to balancing strength and sensitivity. Plus, given that she is pretty epic at karaoke, I think she'll put her signature Serena spin on singing lullabies for the baby. I can't wait for that!"